The November evening chill cuts through Edris Ebu’s clothing, making him shiver. Around him, the wind rushes through the vast open valley with ferocity. Edris steels himself and focuses on the Ethiopian wolf lying still before him, its upper body is covered with a blanket to keep it calm. He moves quickly, injecting the wolf with a rabies vaccine. Once he’s done, Edris—a program manager for the Ethiopian Wolf Conservation Program (EWCP)—motions for his team to take off the blanket. The wolf wastes no time, sprinting into the thick grassland covering the Web Valley. 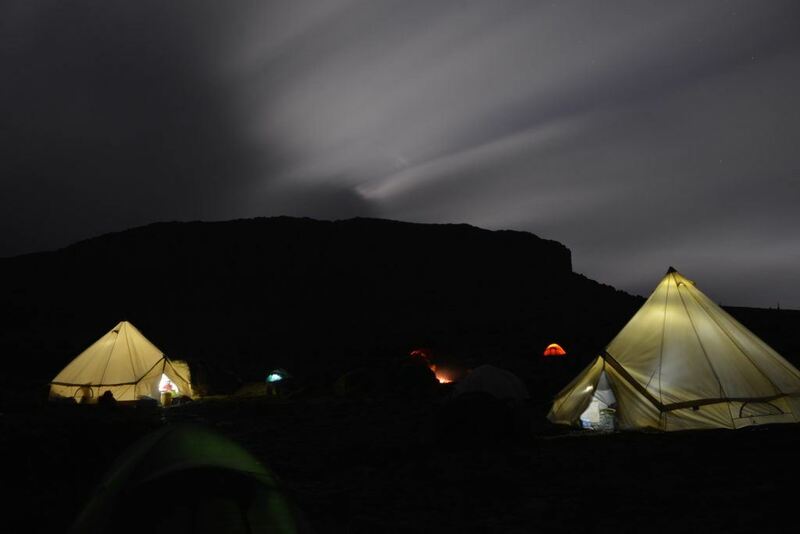 This part of the Bale mountains holds around a 100 wolves, the highest density of Ethiopian wolves found in the country, and EWCP aims to protect as many of them as they can from this latest outbreak of rabies. 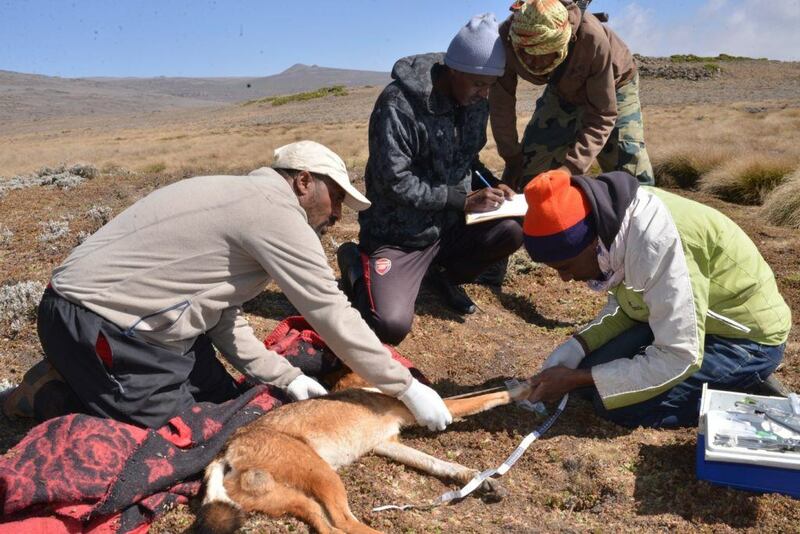 The EWCP team inoculated 28 Ethiopian wolves in just a week, curbing what could have turned into a rampant spread of rabies throughout the valley. Edris and his colleagues exchange smiles, exhausted but happy after six days of responding to the rabies outbreak. With only 500 Ethiopian wolves remaining in the wild, a widespread disease outbreak can be devastating. But their quick response, 28 wolves inoculated in just a week, has curbed what could have turned into a rampant spread of the disease throughout the valley. Unfortunately, the team is very familiar with such outbreaks; since EWCP was founded in 1995, they have endured eight other rabies or canine distemper epidemics. Each of those outbreaks spread to wolves through domestic dogs and ultimately wiped out 50-75% of the wolf population in the region. With this recent epidemic, however, they are witnessing a massive shift; they’ve lost less than 10% of the wolves. Dr. Jorgelina Marino, EWCP’s science director, credits this astonishing shift to a combination of finding the right percentage of wolves to vaccinate (40% across different packs in the infected areas), the team’s rapid response to the outbreak, and their previous vaccination efforts which made some wolves already immune to the disease. While this is concrete proof their conservation efforts are working, Jorgelina is confident most future outbreaks can be eliminated through oral vaccines. Oral vaccines, distributed to wolves within a “meat bait”—meat (typically rats) loaded with rabies vaccine—are less stressful for wolves and easier for EWCP to dispense year-round as a preemptive method. The Ethiopian government agrees and recently signed an agreement allowing EWCP to conduct their first full-scale oral vaccine campaign this summer. Responding to a rabies outbreak is an around-the-clock operation; with their most recent outbreak, the EWCP team spent six days and nights in the Web Valley, vaccinating wolves from across the different packs in the infected areas. Since the EWCP team’s vaccination efforts in November, they have continued to monitor the wolves vigilantly. The wolves are not only healthy, but the population is growing; a huge influx of pups have been born in and around the valley, signifying a welcome reprieve for this rare and highly endangered canid.